Please don’t let the virtual dust bother you too much. 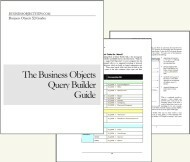 Business Objects Tips’ infrastructure was overdue for some updates and one of those touches on the look and feel. We hope to complete the work soon and eliminate any noticeable disruptions in the mean time. Thank you for your understanding. BOT Was Down: Our Apologies, But It’s Your Fault!